Left to right: Masahiko Nakajima President of Yamaha Motor Racing, Phil Read and Marco Riva General Manager of Yamaha Motor Racing. Saturday the 13th of September represented a significant milestone for Yamaha Factory Racing. Precisely fifty years had passed since the Iwata based company attained its first world championship with the two-stroke 250cc RD56 when English motorcycle legend Phil Read won the Nations Grand Prix at Monza. Read was on hand at the Misano World Circuit Marco Simoncelli to present Masahiko Nakajima (President of Yamaha Motor Racing) and Marco Riva (General Manager of Yamaha Motor Racing) with his original 1964 F.I.M. World Championship certificate. 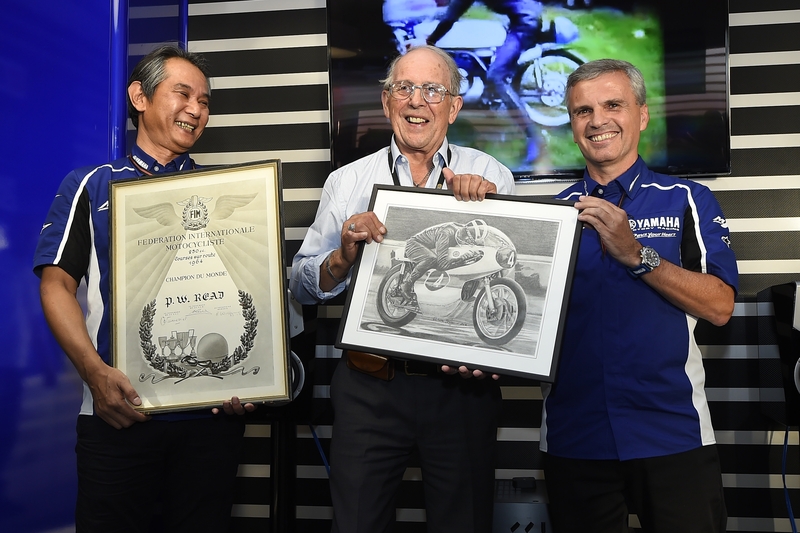 The certificate will now take pride of place at Yamaha’s Hall Of Fame in Japan. A copy of the document has been made that will be signed by all those present to mark the occasion and in return will be presented to Read. Phil Read went on to win a total of eight world titles across four classes, 125GP, 250GP, 500GP and TTF1. His career is littered with impressive achievements, including eight IOM TT race, wins, 121 Grand Prix podiums and four 250cc world titles which have only ever been equalled by Max Biaggi. Alongside Mike Hailwood and fellow Yamaha icon Valentino Rossi, Phil is one of only three riders to have won road-racing world championships in three or more classes. 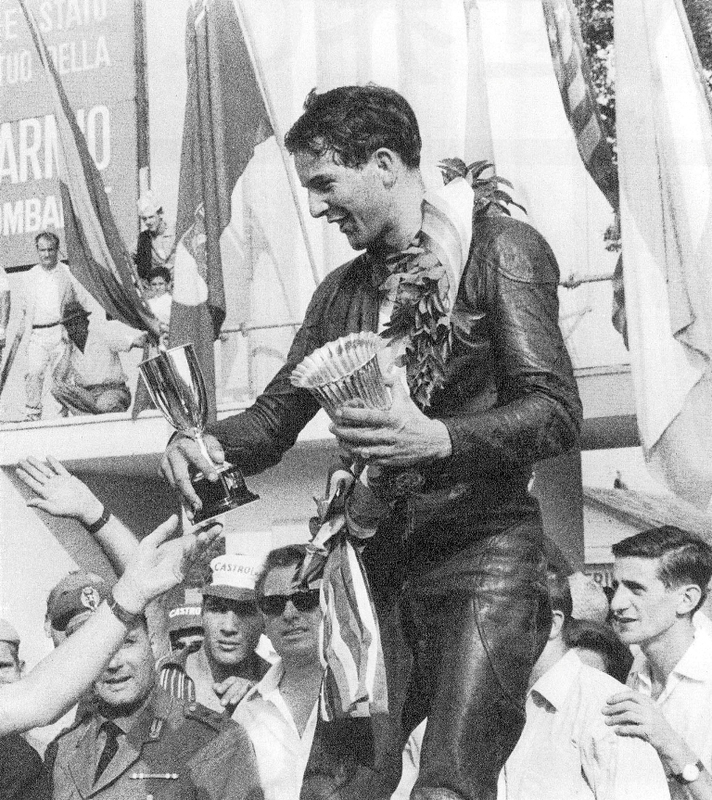 Read receives the trophies and takes the 1964 250cc World Championship. Yamaha followed Japanese rivals Honda and Suzuki into the World Championship Motorcycle Road Racing Grands Prix in 1961. Since the inception of the F.I.M. World Championship Grands Prix in 1949, Yamaha has won 38 manufacturers titles and 37 riders titles that cover 125cc, 250cc, 350cc, 500cc and MotoGP. Words Geoff Dawes © 2014. Images courtesy Movistar Yamaha Factory Racing. This entry was posted in Motorcycle Racing, Motorcycling and tagged Giacomo Agostini, Grand Prix motorcycle racing, Marco Riva, Max Biaggi, Mike Hailwood, Movistar Yamaha Factory Racing, Phil Read, Valentino Rossi, Yamaha RD56 on 15/09/2014 by Geoff Dawes.